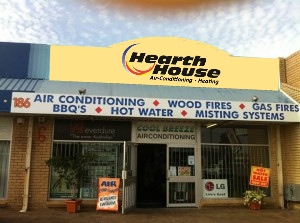 Hearth House relocated is specialist Heating and Air Conditioning store from The Gateway Shopping Centre in Cockburn across the freeway to its new super-store at 87 Armadale Road, Jandakot 2 years ago and continues to provide the residents of the local area including suburbs such as South Lake, Beeliar, Yangebut right through to Fremantle and across to Byford. Hearth House Jandakot services all the way from Applecross down to Mandurah. The industry knowledge of Store Manager Brandon Gillis and Hearth House Sales Manager Stuart Hoxey is second to none and you can be confident that they will give you the right advice no matter what the heating or air con challenge you particular home presents. Hearth House remains committed to providing top brands in home heating, both wood and gas as well as evaporative or refrigerated air-conditioning as the best possible prices and back this up with a fully computerised installation scheduling system to take all the hassle out of chasing tradesmen to install you AC or Heater. Our goal at Hearth house is to make it easy for you to choose the best heater or air-conditioning for you home.